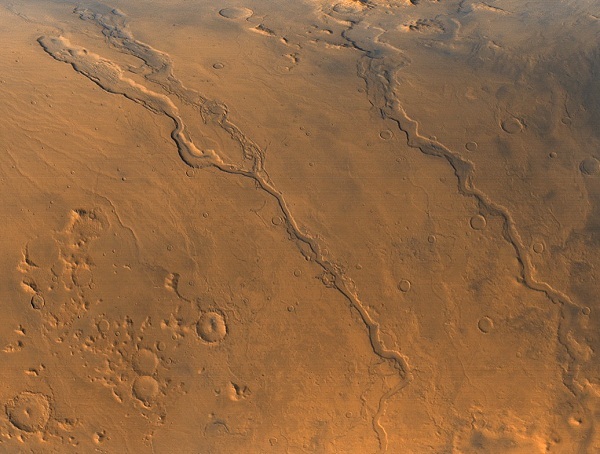 Mars is full of evidence that running water once crisscrossed its surface. Many scientists argue that in its early days, the red planet was nearly blue—a relatively warm place with lakes and even an ocean around its north pole. 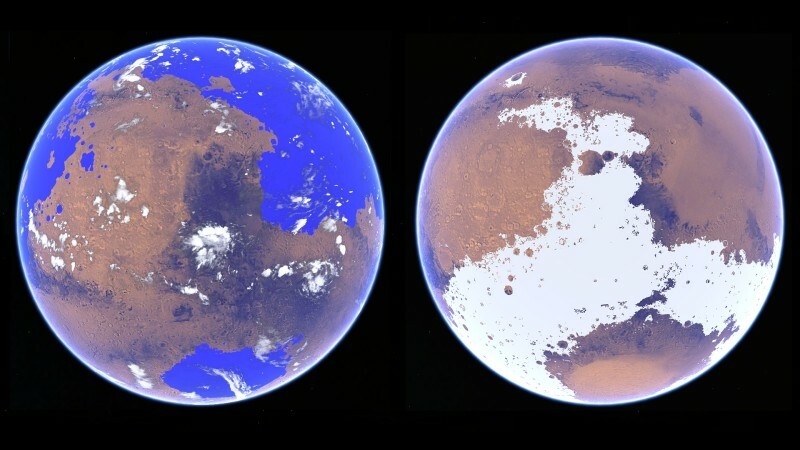 But a sophisticated climate model suggests instead that Mars started out as a cold, icy planet. Today, even though the planet appears completely sterile, it's still a driving question whether Mars has ever had the conditions for life to begin, or at least to survive. 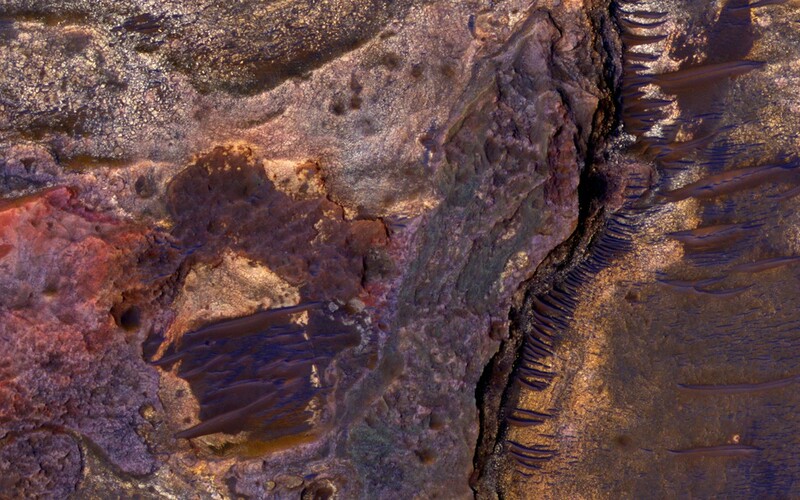 The quest for life on Mars needs to answer two questions: When was Mars wet? And for how long? Mars today is bone-dry and colder than Antarctica. Although it must have formed originally with lots of water and air, its weak gravity couldn't keep water vapor and other gases from escaping to space. But we're sure that during its first billion years or so, before the atmosphere escaped, Mars had rain and snow. Scientists think there was probably water enough for a large ocean in the lowlands around its north pole. The evidence is compelling. Orbiting spacecraft have mapped landforms that can only be riverbeds, water-carved canyons and coastlines from a former ocean basin. 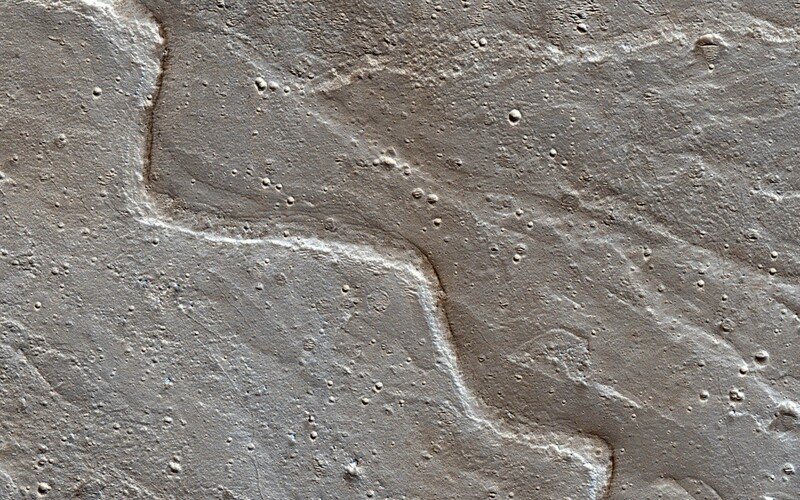 Robot landers have photographed features in rocks, like crossbeds in sandstone, that only flowing water can produce. And they've found chemical evidence of minerals, like clays and gypsum, that require water to form. The presence of water proves Mars once had what scientists call habitable conditions. But it's not enough just to establish that water once existed. The evidence from Earth suggests it takes many millions of years, and a specific range of physical and chemical conditions, for life to arise. The evidence allows some scientists to argue that Mars was warm and wet very early, between 4 and 3 billion years ago. (All the planets are about 4.6 billion years old.) Others hold that conditions must have been dry and frozen most of the time, with brief periods of warmth and running water after geologic events like major volcanic episodes or large asteroid impacts. The prospects for life on Mars depend strongly on these details. Yet a third group of researchers is approaching the history of Mars from another direction. They ask questions like, How do you build a Mars that starts out warm and wet? What kinds of global climate were once possible on Mars? Robin Wordsworth is one of those people. His research team at Harvard has a state-of-the-art computer model that can reproduce any given planet and its atmosphere in three dimensions. It's aimed at rocky exoplanets in general, not just Mars. He trained the model on Mars with the help of colleagues Laura Kerber of Caltech, Raymond Pierrehumbert of the University of Chicago, François Forget of the Laplace Institute in Paris and James Head of Brown University. Wordsworth's study, accepted for publication in the Journal of Geophysical Research: Planets, uses his global atmospheric model to recreate the Martian climate 3 or 4 billion years ago. We know several things about that time: the sun was about three-fourths as bright as it is today, the Martian poles were tilted much more strongly, the planet's greenhouse atmosphere was much thicker than today and most of its surface features were the same as they are today. Wordsworth ran two different versions of ancient Mars by manipulating the atmosphere. One had a relatively thin atmosphere, a frozen ocean and was cold, averaging -55 degrees Fahrenheit. The other had an extra-thick atmosphere, was heated by an extra-hot sun and was warm enough to support liquid water and rainfall, averaging 50 degrees Fahrenheit. The model proceeded to calculate how the winds would blow, how clouds would form, where rain and snow would fall and how the streams would flow. In the warm scenario, the model predicted high precipitation in certain regions like Arabia Terra and the Hellas basin, but water-carved landforms are scarce in those places. Likewise it predicted a "rain shadow" downwind of the great Tharsis bulge, but features made by water are abundant there instead. In the cold scenario, the steep axial tilt of Mars (nearly twice its present value, at 41.8 degrees) meant that snow and ice accumulated not around the poles but around the equator, especially in the highlands. This concentrated water-carved landforms in that region too, which is where they're found today. In general, Wordsworth found it hard to make a warm Mars work at all. It required unrealistic conditions, and the results didn't match the landscape. It was easier to have a cold Mars that could be warmed up every once in a while. Orbital changes, volcanism, and cosmic impacts could all do the job and send water coursing over the Martian surface, leaving the telltale signs that remain today. This is a pioneering study that relies on many simplifying assumptions. But it strongly suggests that Mars in its youth was white, not blue, before it turned red. Still unknown is whether Mars was ever green.